I’m on a tart making spree! This happened once several years back when there was an online tart and pie bake-along event where I did Pierre Hermé’s Tarte Ispahan, Ladurée’s Tartelettes Croustillantes Abricots ou Cerises and the classic Tarte Bourdaloue aux poires all in a short span of just days apart from each other. It was crazy but fun! Days back, I saw good figs at our local supermarket, and was determined to reprise Hidemi Sugino’s Tartelette aux Figues which I also did at the end of that same year back in 2011 but alas came feijoas and I got distracted, out of which Tartelette au Feijoa et Chocolat Noir was created. 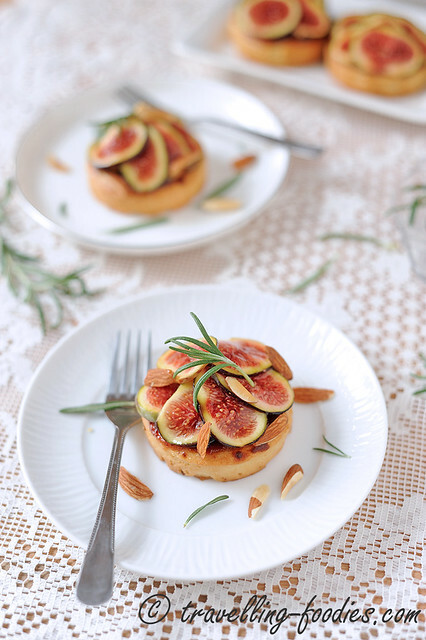 However, determined not to let those beautiful fresh figs, and the extra pâte sucrée in the fridge go to waste, I made yet another round of of tartlets, this time a pairing between figs and rosemary, Tartelettes aux Figues et Romarin, inspired by flavours of the Mediterranean Aegean Sea.